Be forewarned, gentle readers, that what follows is a tale of woe and frustration the likes of which mortal men were not meant to hear. It may drive you mad with despair, an experience akin to staring into the gaping maw of Shub-Niggurath, the Black Goat of the Woods with a Thousand Young—only this story will not be followed by the sweet release of death from your now cursed existence. From this point forward, neither GameCola nor myself bear any responsibility for your doomed, soon-to-be-shattered psyche. This article also contains minor spoilers for Castlevania 64, so there’s that, too. I received Castlevania 64 for Christmas the year it came out, and oh, I played the hell out of that game. I mean, it was Castlevania! In 3D! This was, of course, back when 3D games were still pretty new, so just about any 3D game done reasonably well was something to get excited about. Also, I didn’t have my own income at the time, so I had to work with what my parents bought me for Christmas and my birthday. Anyway, what I’m getting at here is that my standards were kind of low. I played Castlevania 64 a lot, but I was in no way blind to its many faults. The controls and camera movement were terrible, causing many missed attacks and jumps, and often leading to humiliating demises. Still I persevered through the game, many times over, if only for the fact that a) I get bored easily, and b) I freaking love Castlevania. There was one part of the game, however, that always gave me trouble. In this area, you have to destroy a section of a wall to access a switch behind it. Now this particular section of wall is at the bottom of a tower, and to destroy it you need to scale the tower, obtain an item called “magical nitro,” then climb back down the tower to the wall. Getting up the tower isn’t that difficult, but the magical nitro throws a twist into the trip back: If you jump, fall off a ledge and hit the ground, or get hit by an enemy, the nitro will explode and you will die. Once this happens, you have to start allllllllllllllllllllllllllllllllll the way back at the top of the tower where you obtained the magical nitro. On your way up the tower, you might notice some platforms and walkways that seem out of place or that serve no purpose. “Why would I use that narrow bridge when I can just jump across this gap?” or “I wonder why there’s a small path laid out through these giant gears?” you might say to yourself. Well, the answer to both those questions, and more, is magical nitro. The whole section of the game is nerve-wracking, to say the least. Enemies can essentially kill you in a single hit, making it best for you to just run away. Those narrow bridges and small pathways through gears become the only way for you to pass through areas, and they are often flanked by lizard-men shooting fireballs at you. To top it all off, the final corridor before the room where you need to place the magical nitro contains a pair of motorcycle-riding skeletons. To this day, the thought of those bastards still sends chills up my spine, because they were the only part of this horrible trek that I never developed a decent strategy for. They’re fast, somewhat random in their movements, and if you try to run away they WILL chase you down. If you’re using the Belmont character (technically his name is Schneider, but he’s got the whip so he’s a Belmont to me), this is even tougher due to your need to get in close to attack (the other character has unlimited range homing attacks, because that’s totally fair). Anyway, during one of my playthroughs of the game I was having a particularly tough time with this part. As usual, I could handle everything except for the damn biker skeletons. On my third try I finally managed to get rid of the bastards before they hit me and was home free. I entered the large chamber where the main character has to place the magical nitro and breathed a sigh of relief. It was at this point that my brother, who had been watching my repeated failed attempts, came up beside me and yelled “JUMP!” right in my ear. Somewhere deep in my brain a neuron fired, responding to the command. My thumb instinctually slid to the A button and pressed it. Time slowed down as I watched my character leap into the air and slowly fall, his fate sealed by my stupid, jerkass brother. As Schneider hit the ground, the magical nitro exploded, and with it all my hopes and dreams of finally finishing that thrice-damned level. Needless to say I jumped up and started wailing on my brother, but the only thing the jerk did in response was laugh. 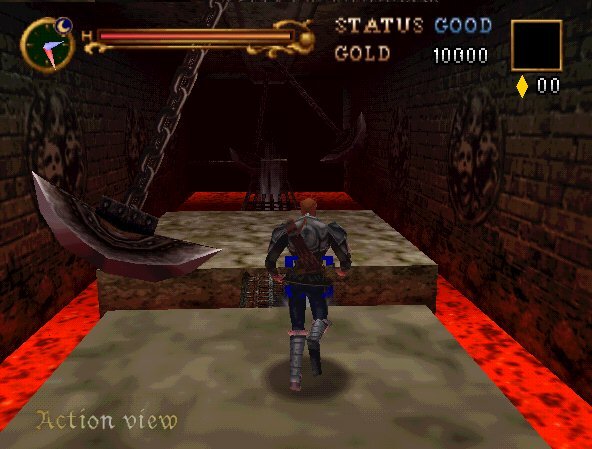 I think that was the last time I ever played Castlevania 64. The whole magical nitro section of the game just wasn’t worth dealing with anymore, and even when they came out with remakes and alternate versions of the game I avoided them for the same reason. My brother still occasionally mentions the incident, which inevitably leads to me punching his arm repeatedly while he laughs at my magical nitro-induced mental scarring. These days, I still play Castlevania games, and I typically enjoy them, but there’s always that hint of dread whenever I start a new one. “Will they bring magical nitro back in this one?” I wonder to myself, fearing for my sanity. So far the answer has been no, and I pray that it always will be. Ahh, Castlevania 64. I really, really, *really* wanted to like that game and, well, I did, back then, but it doesn’t really quite hold up these days. I dug the violin intro, though, and I thought it handled atmosphere reasonably well. And, if you were like me and could only afford one system at the time (Read: Your rents weren’t going to plunk down their hard-earned coin on a second console and you didn’t have a job at the time), and you really enjoyed Castlevania 64 (because, again, you or your rents couldn’t / wouldn’t afford a PSX and, thus, Symphony of the Night), the remake / sequel / prequel (PreSmequel? Ah, forget it…) “Legacy of Darkness” offered up more of the same with a timey-wimey twist and some enhanced visuals courtesy the N64 Expansion Pak. So there’s that. Since I was a kid, I’ve always had this weird patience no youngster should have, so I kept trying this frustrating task until I finally beat it. Unfortunately, I did try it a hell-a-lot of times, since my memory isn’t as my good as my patiente, and sometimes the “you shall no jump in this level” reminder wore off and I just stupidly jumped straight to my and Belmont’s misery. I really, really enjoy this game. I also think Daikatana is the last great FPS.